Kingsdown Gate is a new residential development of 92 units by Barratt Homes on Hyde Road in Stratton, just north of Swindon. The new development features a mix of two, three and four bedroom homes; several of these feature USK 1500 Catnic Juliet balconies. Designed to provide a safety barrier in front of French windows, the Juliet Balconies at Kingsdown Gate give character to the modern housing development. Situated on the upper levels, external to the French doors, they are fixed onto a Recon Walling Stones finish. The balconies make use of light and space internally, by enabling the specification of floor to ceiling windows, which couldn't normally be achieved with standard windows. The USK 1500 Black powder coated Juliet balconies from Catnic are manufactured in a way that offers a stylish, affordable feature to housebuilders and specifiers. They were the ideal choice for Kingswood Gate and in keeping with the architectural detailing of Barratt Home's portfolio of developments. "Our Juliet balconies are a stylish, hard-wearing choice perfectly suited to this development. What's more housebuilders and contractors get the technical information and support they have come to trust from Catnic, as a market leading brand in the industry." The balconies are designed, manufactured and tested to meet building regulations and NHBC technical requirements. The USK balconies are fully submerged in zinc after manufacture, which provides a complete surface protection. 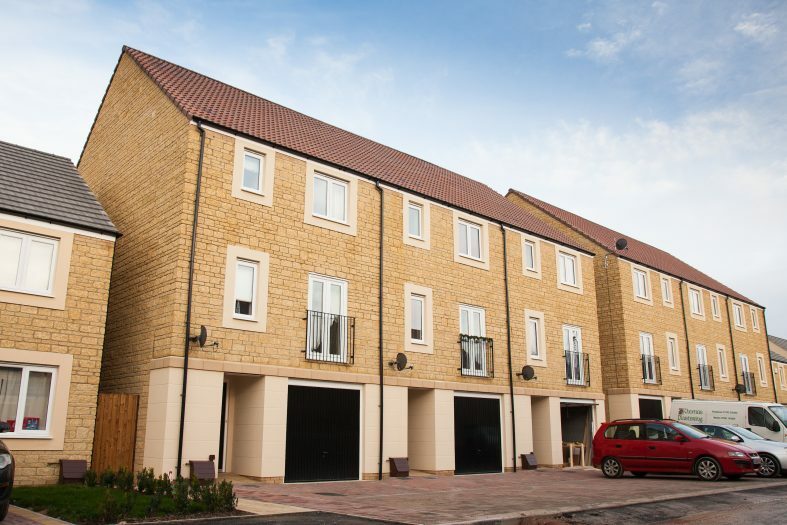 Civils & Lintels builders' merchants in Westbury supplied the durable long-lasting balconies for this project.